The Nissan Sway concept, shown this past week at the Geneva Motor Show, consolidates some of Nissan’s design themes into a single expression that’s important for Europe. Although it’s worth wondering: Are we also seeing a first glimpse of the look of the next Nissan Leaf electric car? The Sway is said to be aimed at European tastes and presaging the look of future small cars, especially for European-market hatchbacks. 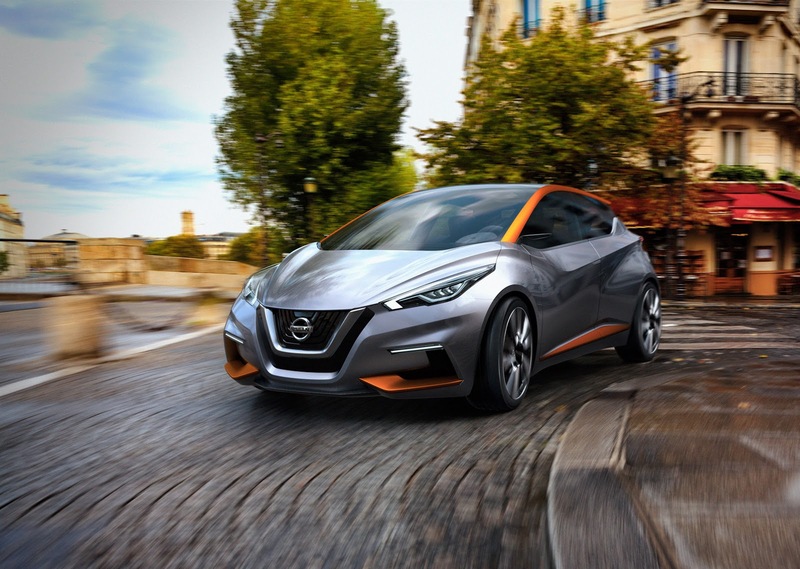 Nissan officials added that it shows the potential direction of the next generation of the Micra minicar, which is sold and marketed as the March in some markets. The current five-door Micra is about 150 inches long and falls into the what’s termed a supermini in the European market. Yet the concept is a bit larger than that, at about 158 inches long, 70 inches wide, and 55 inches high, and riding on a longer, 101-inch wheelbase. In person, the Sway looks great—stunning is no exaggeration here—and it has a presence that feels muscled yet technical. And, we think, it’s a design that would fit right in alongside the larger Nissan models—the 2016 Maxima and 2016 Murano—that have been recast in sportier, more adventurous designs, including the same V-motion grille, ‘floating’ roof design, boomerang taillamps, and upkicked rear pillar. There’s a glass roof—a feature that seems requisite for concept cars this year—with a structural ‘X’ crossing in the middle. The concept borrows the steering wheel and some of the simple, back-to-basics layout that was first shown in the brand’s retro-styled IDx Concept, first from the 2013 Tokyo Motor Show. It has just two instruments facing the driver, while all other functions have been pushed over to a trapezoidal, tablet-like screen that’s within reach of the driver and front passenger. Overall, there’s a sense that this design has been radically decluttered, with the simple, aluminum structure of the seats exposed, and a suede-like fabric with pearl-effect materials. “With this new concept car for Geneva, we are experimenting to see how Nissan might be able to bring fresh ideas to the compact hatchback segment,“ said Nissan design chief Shiro Nakamura in a release on the concept. It’s a design that could show a lot of potential for the next Nissan Leaf, especially in what we see on the outside. The automaker is mum about the possibility; yet considering that Nakamura told us last year that the next Leaf will have “less EV-ness” than the current model, and a design language that's more unified with the rest of the model line, it’s a potential that could bring a lot more attention, beyond just EV enthusiasts and frugal types.